Motor racing commentator Eddie Jordan is the spitting image of John E. Fry but whilst both like wheeled sports Fry’s interest is in the human powered variety. 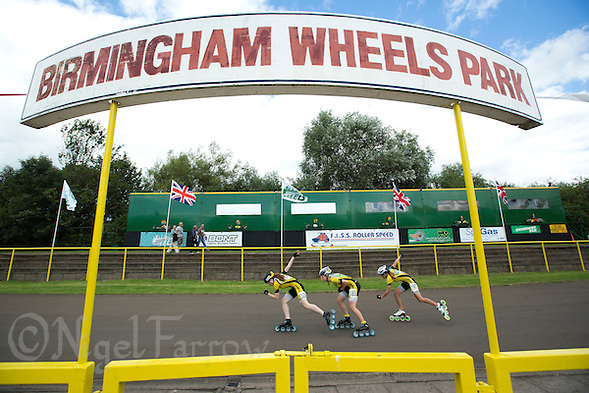 Currently the chairman of Birmingham Wheels Roller Speed Club, one of only eight inline speed skating clubs in the country, he has an encyclopaedic knowledge of inline skating and has been involved in many of the important moments in the sport’s history in this country over the past 30 years. He now coaches the next generation of skaters. This isn’t without its problems. “Because we’ve got no commercial rinks, we’re bringing kids in who can’t skate so before they can be a speed skater you’ve got to teach them to skate. 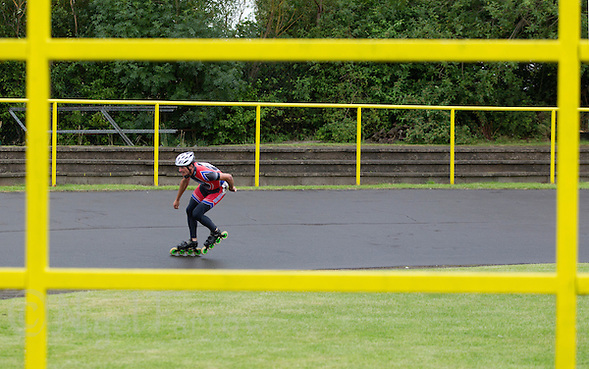 The track he is referring to is at Birmingham Wheels Adventure Park and is one of only two purpose built roller speed skating tracks in the country. Unfortunately, its future is in doubt. Built on the site of a 40 acre council tip the park was the idea of Birmingham Assistant Chief Probation Officer Bernard Mouzer who wanted to see a wheel based adventure park to keep children off the streets in the inner city areas. The park, which is now run by a charity with a director appointed by the city, was originally given a 120 year lease. Now the city council, like many others in need of money, is considering selling land to developers to raise funds. In the case of Birmingham this includes the land the track is on. One possibility is that whilst their track is not on the actual route of the High Speed Rail link between London and Birmingham the club fears that it could still disappear under the train line’s corridor through the city or become the site of the maintenance depot. Even suggestions in the media that the rail project may not go ahead do little to soothe concerns as the club’s management recognise that future regeneration of the area will see them on land that could be considered suitable for industrial units or housing. The club are discussing the possibilities of relocating their track, maybe nearer to other sports facilities in the city, but in the meantime the current facilities need upgrading. The five year lease they have been offered makes it impossible for them to access grants such as from the Sports Council who require beneficiaries to have the minimum of a 10 year lease. “We’re stuck with chemical toilets, we’re stuck with a track that’s getting tired and needs resurfacing but we can’t go for this wodge of money that we can access and would stand a very good chance of getting. We’d need a ten year lease so what the city is offering us is of no use at all” explains Fry. 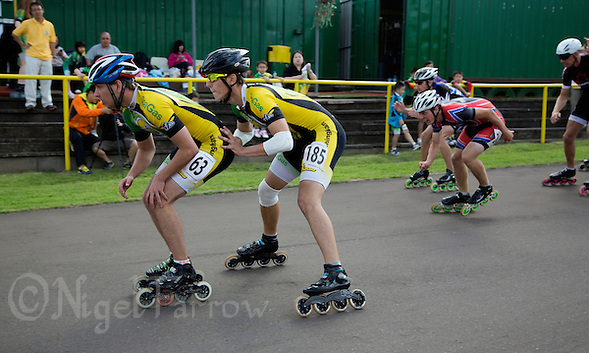 Although the first roller skates had appeared on the streets of London in the late 1700s, it was not until the 1870′s that the sport came to Britain with its first national championships taking place in Wandsworth in 1894. 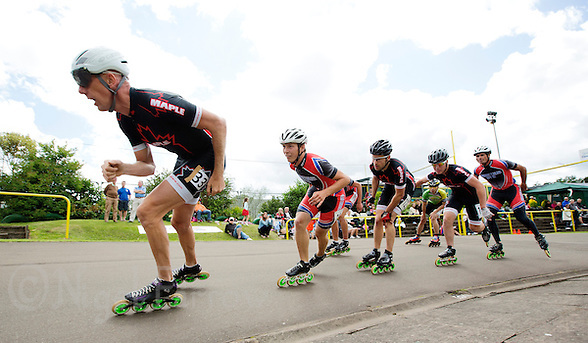 Racing on quad skates, a situation that continued until the 1990′s when the modern style of inline skates developed for training on solid ground by ice speed skating competitors in the 70′s became popular, the sport gathered momentum in the country so that when the first European Championships were held in 1936 in Germany the British team won six of the eight titles. Two years later the first track World Championships were held in London with Great Britain’s William C. Ross, Harold Wilkinson and Arthur Cooper winning four of the eight gold medals on offer. Since then, aside from a world championship medal for Leo Eason in 1963 and another for John Folley in 1969, Britain’s international success for both the men and the women has been restricted to the European Championships mainly during the 70′s and 80′s. 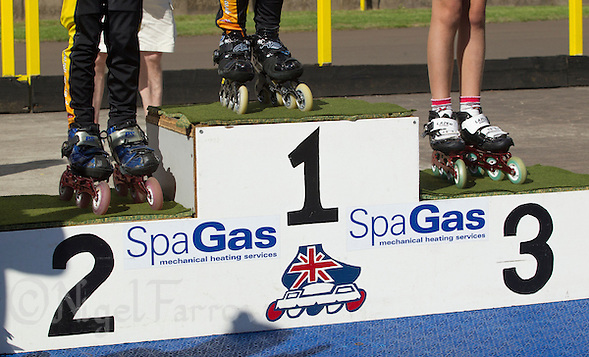 Since then the number of competitors has dwindled as the commercial indoor roller skating rinks, and so their speed skating clubs, have closed. “When I started there were two in Birmingham” says John E. Fry, a three times European Champion. “We haven’t got one now, and that is where the nucleus of skaters came from. He is though still optimistic for the future of the sport. 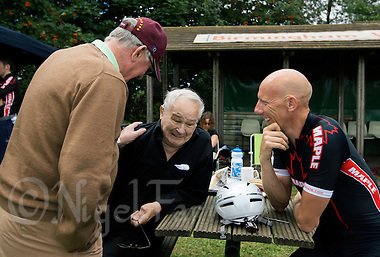 “We are where cycling was thirty years ago. Cycling had got a declining membership, the national governing body was almost bankrupt, and then they built Manchester (Velodrome). 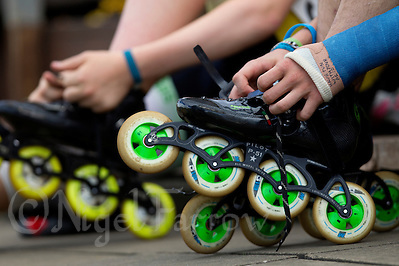 Currently the British Roller Sports Federation oversees all the roller sports but each sport administers its own memberships separately and they all act as individual entities for the majority of the time. 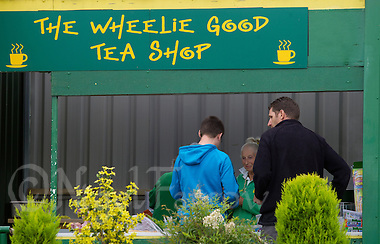 Whilst he would welcome an injection of money into roller sports Fry is realistic about how much they would benefit in the immediate future. 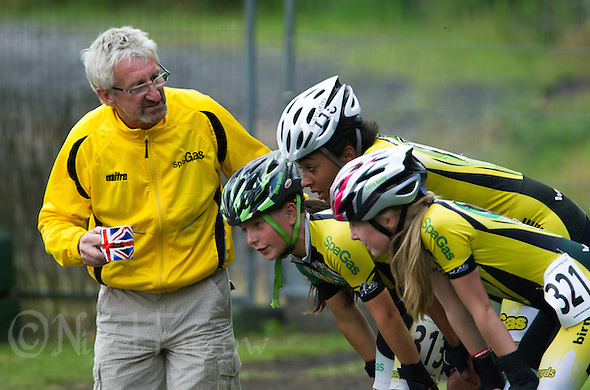 He recognises that the current inline speed skating governing body, or a roller sports governing body with the structure he suggests, would need time to get their infrastructure right to establish a strong foundation in order to have success on par with British Cycling. 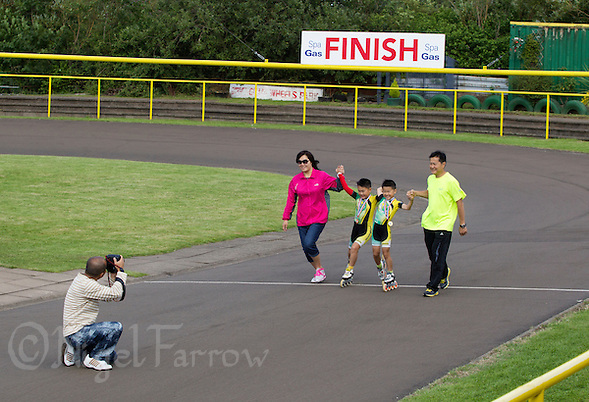 Currently the sport has around 100 competitors racing at the top level across all the age groups but the sport does have a growth area – marathons. 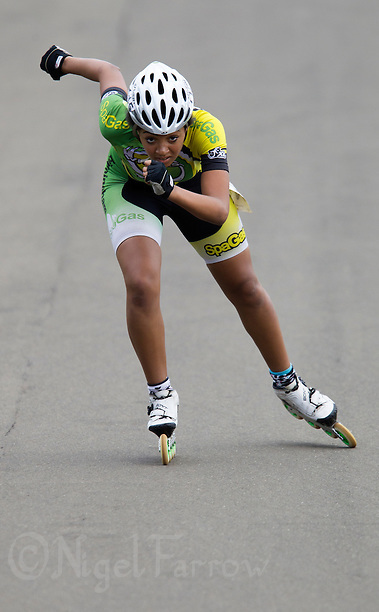 “I hadn’t competed since 1987 and then last year decided to do the Berlin Marathon and there were 6500 skaters. It was oversubscribed” recalls Fry. “There is actually a world inline cup series of marathons and they’re really well supported. 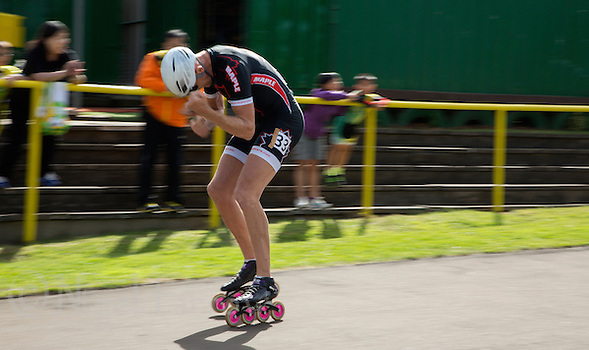 In the meantime Fry continues to search for the next British track world champion hoping to break the dominance of the Colombians in whose country inline speed skating is the second most popular sport after football. It isn’t going to be an easy task. Along with the lack of training venues he knows from personal experience the hard work involved. 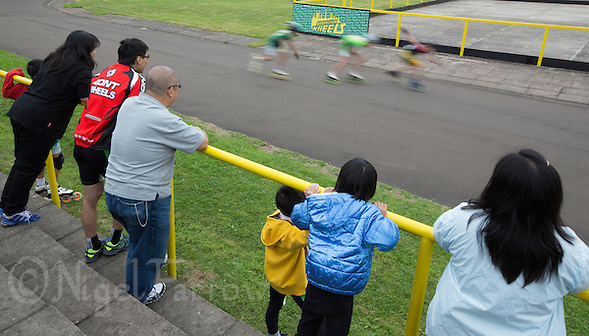 Despite all the difficulties the club continues to attract children from the surrounding area to the green and yellow outdoor track as in keeping with Mouzer’s original vision. “Not any kid in our club, and there’s twenty odd of them, go to the same school. They didn’t know one another before they came here and they have come here for different reasons,” he explains, “so we’ve got to try and get them to gel and create a social unit as well as a competitive and training one and everything else. “If you don’t, they tend to come out here on a wet Sunday morning in October, November or February, March and it is hard work. “So we’re continually fighting a battle. 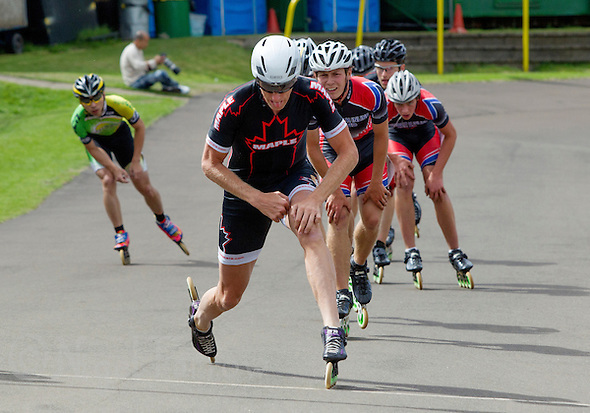 This is a particular challenge for inline skating. 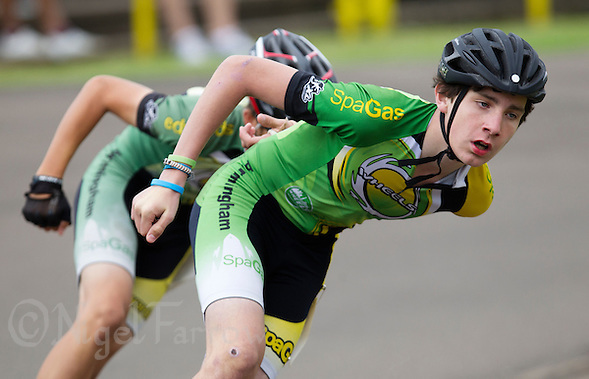 The physiological requirements and type of racing are similar to those of track cycling with at least one of the younger national squad members attracting the attention of cycling’s governing body. With cycling’s higher profile and all that it can offer a potential sports star, such as possibly racing at the Olympics against the World Games, this could be a battle that British inline speed skating will lose. 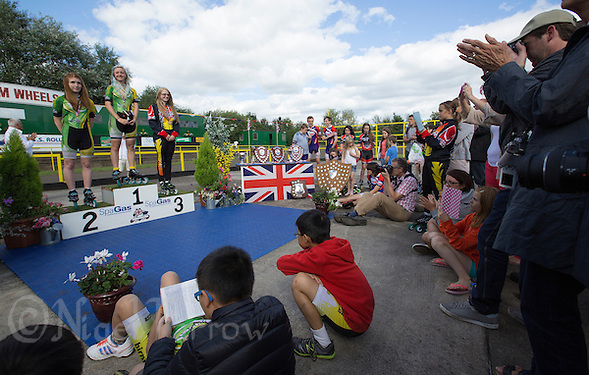 However if the sport can get past its current difficulties then it is possible future generations of skaters will be able to stay and help restore the sport to the glory days when it shared a governing body with ice skating. “As a small fish in a big pond, other than your Cousins’ and Currys, and your Torvill and Deans, we always used to get the best results. We were always winning the World Championships or European Championships or whatever” recalls Fry. Posted on Friday, September 6th, 2013 at 8:37 pm. 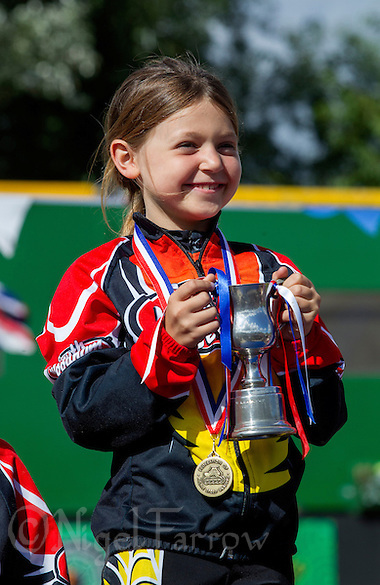 | Categories : Feature, Inline Skating, Recent, Sport | Tags : ben coole-probert, birmingham wheels adventure park, british championships, championships, federation of inline speed skating british outdoor championships, ffion lewis, fiss british outdoor championships, hs2, inline skating, inline speed skating, john e fry, kirsty pullen, leo eason, les woodley, michael mcinerney, national championships, paige aitken, roller skating, roller speed, sport, sutton atkins, will dobson.